APD Dumfries produced a below par performance in their loss at Nunholm to league leaders Uddingston in the Western Premier League on Saturday. Dumfries were put in to bat and, with runs proving difficult to get, had reached 58 for 1 in the 22nd over when opener, and Glasgow University Crichton Man of the Match, Alan Davidson was caught for the top score of 31. Three more wickets fell for just five runs and the innings was struggling. Scott Beveridge resisted with 27 but the Uddingston bowlers nagged away with Reddy taking 3 for 12 as Dumfries were all out for 135. The necessary early wickets didn’t materialise as Dumfries pressed too hard for the wicket taking delivery and Uddingston profited. Opener Rai was first out with the score on 58 and fellow opener Gul was caught off McCutcheon for 35 at the hundred mark. The winning total was reached for the loss of three wickets with pro Priyadashrana not out on 44 for a comfortable win for the visitors. On Saturday, the Scottish Cup resumes with APD Dumfries away at Ferguslie. 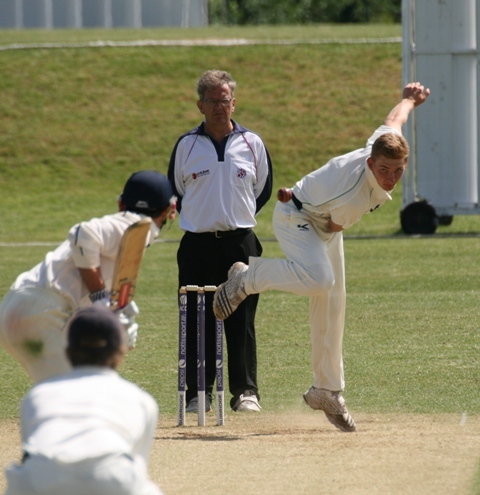 During the week Niall Alexander opened the bowling for the Scotland Development XI against the MCC, taking two wickets, and was also selected for the upcoming games for Scotland U17s, and along with Peter Lojszczyk named for the Western Warriors 20/20 Pro Series match at Titwood in Glasgow on Thursday. On Sunday, Dumfries Women won at home against Galloway in the National League. Dumfries set an imposing target reaching 144 for 1 in their twenty overs. Opener Kirsty Strachan claimed the Parkdale Garage Dumfries Player of the Match hitting 70 not out and was well supported by Rachel Howard with 33 not out. Strachan and Rosy Ryan bowled well to take two wickets each as Galloway reached forty nine in reply. The Club’s Women’s coaching sessions take place on Friday evenings. Summer Junior Cricket: A Club summer camp is taking place at Dumfries Sports Club, Nunholm, on Thu/Fri 18/19 July (10-3) for boys and girls (£25, Age 8-16). Suitable for beginners, to book a place, or for details, contact the Club on dumfriescricketclub@gmail.com or 07799 856094, www dumfriescricketclub.co.uk. Club junior coaching sessions also continue at Nunholm each Monday for the summer from 6:15-8pm.